I don't know how Jason does it, but here's another FREE edition of the Vegan Culinary Experience. Over 80 sandwich-related recipes and neat info packed into over 150 pages. A downloadable PDF, this is, with all due modesty as a contributor, a gourmet effort that is as large as many cookbooks. Profusely photographed, quite detailed, marvelous indexing, you must check this out! Here's a general description of this issue, followed by images of the Cover and Table of Contents (click on each to read a larger version). Honored to be along such esteemed company in this magazine, and it's a fine contribution to the Vegan Community. Besides, it was also cool to show that I do more than create Heart Healthy Pizzas! Articles: When Is a Sandwich Not Really a Sandwich? by Jill Nussinow, The PB&J: America's Favorite Sandwich by Robin Robertson, Sandwich Activism by Madelyn Pryor, Heart Healthy Greens of Spring Sandwich by Mark Sutton, The Reuben: An American Melting Pot Sandwich by Tamasin Noyes, The Celestial Sandwich by Angela Elliott, Religion, Politics, and the Third Rail: Sandwiches! by LaDiva Dietitian, Sandwich Construction by Jason Wyrick, What You Need to Know about How the Pharmaceutical Industry is Poisoning Pigs, Poultry, and People by Mindy Kursban and Andy Breslin, Tasty Homemade Vegan Breads by Liz Lonetti, and The Vegan Traveler: Hudson Valley, NY by Jason Wyrick. With recipe contributions by Ani Phyo, Dynise Balcavage, and Sharon Valencik. Interviews/Reviews:- Interview: Cookbook Author Tamasin Noyes; Product Reviews: Casa Noble Organic Tequila, Eppa Organic Sangria, Daiya Cream Cheese, Earth Balance Cheesy Puffs, Beyond Meat, Book Reviews: Vegan for Her, Vegan before 6, Practically Raw Desserts, and Whole Grain Vegan Baking. Daiya Cheese: "Expensive, Unhealthy [Vegan] Crap." It's no secret that I abhor Daiya and all the other "self-promoted as healthy" faux cheeses. Hell, I even wrote an appendix in my book devoted to detailing the FAT content of these nutritiously vapid and expensive taste addictive quasi-food substances (here's some of my previous posts: 1, 2, 3, Rip Esselstyn on "Daiya"). One of the reasons I wrote my book was to promote alternatives to this fatty junk food. I spent near SIX years devising heart healthy cheese-like sauces with NO OIL. Here's a summary of 15 Reasons to Avoid Added Oil as a refresher for those not aware of my thoughts on the matter. BTW: some processed fake cheese products contain as much fat per serving as whole milk mozzarella. "Hi, Mark -- just wanted to chime in with my own experience with Daiya. I've been a Vegan for nearly 25 years now but over a year ago I saw Daiya in my health food store and thought I'd give it a chance. My first reaction to it was that cold out of the package it looked, smelled, and tasted like stale, sweaty shoelaces. But, what the hell, it melted great and tasted better hot, so me and my family ate it for about a year. We used it in all kinds of recipes that harkened back to our pre-Vegan days--pizza, tacos, heck just about anything that called for cheese in the recipe. After about six months of after eating the stuff pretty regularly, I felt ... weird. You know the old joke people would say about eating a heavily cheesed pizza? The old "Man, I can feel my arteries hardening as I eat this!" Well, it was like that. Exactly like that. It actually felt like my arteries were clogging up and shrinking with each bite I took. Silly me (by then addicted to the gooey matter), I ignored the feeling and kept right on eating the stuff. I thought, surely there can't be anything wrong with it ... it's not like it's real cheese. Six more months passed and in that time I noticed that I was getting indigestion almost every day when I rarely ever got it before. One day, I was surprised to step on the weighing scale and discover that I was twenty-five pounds heavier. Strangely, I didn't look it, but I was. Let me just say here that I'm in good health and exercise regularly, but one night I went to lie down in my bed and got the whopper of all chest pains--something I've never experienced in my life. I really thought I was going to die. Right away my subconscious was telling me it was the Daiya. It just had to be. There were no other changed factors in my life that could have accounted for it. Naturally, I cut out eating the stuff immediately, for my health and my family's health. I returned the unopened packages we had to the store. I've been off the stuff for several months now and my heart feels normal, my arteries clear. We all feel better, lighter inside. Never again will I do something as stupid as get a "so-called" health product that claims to be a substitute for a non-Vegan item. There are too many other things to eat out there without needing something that looks like cheese or whatever else. If me and my family had been Vegan all our lives (we wish!) we would never have encountered something like cheese in the first place, so why try to copy it? If you're Vegan, just be thankful you are because it's a health choice as well as a moral one. I think it's wrong the way this Daiya product is marketed like it's actually healthy. It's junk food, pure and simple. Nothing but saturated fat, gooey and totally unnatural. It just clogs up your insides and screws with your digestive process making you feel heavy and sluggish. Daiya, meanwhile, is laughing all the way to the bank at all the people they have suckered in with their inedible product. If you feel any of the feelings I've described at any time while eating this goop, do yourself a favor and quit the addiction. You'll live a longer and healthier life and you will save hundreds of dollars a year from not buying this very expensive, unhealthy crap. But why wait until it's too late?" Her words touched me, and elucidated what I've felt all along. I recently visited the Daiya website, noting that they spend more time discussing what they DO NOT have in their products than they do. Here's what's in the Cheddar Cheese. Recognize any Whole Foods in this description? "Filtered Water, Tapioca Starch, Palm Fruit Oil, Expeller Pressed non GMO Canola Oil and/or Expeller Pressed non GMO Safflower Oil, Coconut Oil, Pea Protein Isolate, Natural Vegan Flavors, Vegetable Glycerine, Brown Rice Syrup, Sea Salt, Yeast Extract, Xanthan Gum, Lactic Acid (Vegan, for flavor), Annatto (for color) Carrageenan, Titanium Dioxide (a naturally occurring mineral), Vegan Enzyme." And yes, the bastards are still using Palm Fruit Oil, which is heinous not only from the saturated fat content, but social issues (threatening the existence of Oranguatans). Drs. Caldwell Esselstyn and Ornish have REVERSED heart disease, the number one killer of people in the world, through a NO-added oil plant-based diet. Dr. Barnard has done the same with Type II Diabetes. Drs. T. Colin Campbell and John McDougall say to avoid added free oils. The evidence is in. These fake cheeses merely drain your pockets, foment your taste addiction to fat, are nutritionally useless, and help bring about so many degenerative diseases in your later years. These nutritional experts all note that "moderation kills." As does "free oil", Daiya kills. It might help the animals to not ingest dairy cheese, but you eat this stuff, and you're not helping yourself in the long run. Just because it's "vegan" doesn't mean, by any stretch of the imagination, that it's healthy. How disappointing, in thinking about it all, that a major Veg magazine was recently so proud to announce that they were awarding someone at random, "A Month's Supply of Daiya Cheese" in celebration of a Facebook "like" threshold. "Hey, here's a month's worth of fat-ladden, nutritionally useless, cheese-like stuff for you to eat and enjoy. Lucky you!" Maybe this attitude and apparent nutritional ignorance helps explains why, after a year of having the copies I've sent them, they still haven't done a published review of the "1st Vegan Pizza Cookbook." Perhaps their sponsors weren't enthused by the concept of heart healthy pizza made with whole grains, legumes, nuts, seeds, and vegetables." All-Creatures Review of "Heart Healthy Pizza"
The All Creatures Website has been around for OVER 15 years! One of the original vegan, animal rights websites, it is chockful of recipes, news, reviews, and information. An obvious labor of love by the Mary and Frank Hoffman Foundation (who've supported and donated to many very important animal rights/vegan documentaries and projects over the past decade and a half), it's old school in design, but still retains its timeliness in content, heart, and spirituality. "The thing we like best about Heart Healthy Pizza are the wonderfully different ideas for making heart healthy vegan pizza; things that we hadn't even thought of in our decades of creating healthful vegan recipes, and publishing them on our web site." The Recipes (with photos) section of this website is extraordinary and one of the first truly comprehensive collections of vegan recipes and animal rights information on the web. Think about it: 15 years ago this was a godsend. It was still amazing and vital resource to many of us struggling forward without the plethora of vegan cookbooks, websites, blogs, and social media sources available these days to help people eat healthier and vegan. By all means, check this out! They've obviously influenced many a recent vegan cookbook author (including, I'm proud to say, yours truly!). Lord knows how many people they've helped with their web and financial resources. And while you're at it, check out their newsletter, and pass the link on to someone you know. This is from two of the original groundbreakers, those who were swimming against society's tide long before many of us had our first tofu burger! You want to see how far we've come and why? here's one of the reasons: They showed us the true power of the Internet, long before anyone else in the movements! Explore, learn, enjoy, and marvel at their dedicated and altruistic efforts. Thank God for all they've done, and I for one, will always be appreciative. They were a digital oasis in a lonely world at the time, and I'll never forget the comfort I gained from spending time on their website. Kudos! My nephew, Mom's grandson, being taught by 2nd generation pizza master! The reasons "why" are summarized at the link above (with a photo of Mom, who died on Mother's Day when I was 14 years old). VeggieSue's Review of "Heart Healthy Pizza!" "While I haven't made that particular pie of his (yet), I have made others, and they beat anything you'll find in the grocer's freezer by miles and are perfectly fine to eat on any plant-based food plan, whether it's Dr. McDougall's, Dr. Fuhrman's or even the more restrictive Dr. Esselstyn's, and everything in-between." From VeggieSue's Veggie Adventures. I'd gotten lazy and did a web search to find the name of my own video channel (that's what fatigue does to you), and found her short, but cool review of my cookbook! Sue's also a long-time member of the Fat Free Vegan Yahoo Group, and also, I think, the Eat to Live Yahoo Group. So, what did I finally do with the unusual yard-harvested Sorrel & Mint Hummus I posted last entry? Well, been kicking around a new bread (or pizza dough!) recipe in my head that involves using whole wheat flour and millet seed (millet is not a grain, and I'm not using it as flour herein). But, the quandary was "what" would balance with strong chlorophylly-flavored minty, lemony chickpea hummus? I literally woke up in bed in the "wee hours" with a flash of solution, it's Middle Easternish! Cumin and cinnamin... cool... and got to experiment with the tripod and lighting. Here's one of my favorite photos from the two sessions (yup, over a two day period). Recipes will be submitted to the Vegan Culinary Experience magazine for the upcoming "Sandwich" issue! Neat to show that I can do more than pizza in the kitchen. And of course, it's all "no oil." Heart Healthy "Sorrel & Mint Hummus"
The lemony sorrel and mint combo, with chickpeas, garlic, and finely ground toasted sesame seeds (thereby no need for the very high fat/oil tahini which is customary), kicked really well together. If I don't use the recipe for VCE, I'll post it on this blog in mid-May. One could substitute for the sorrel using raw spinach and probably some additional lemon juice. Click on to see larger image! Whew.... just finished several hours at a video studio staffed with several pros who knew their way around the three HUGE cameras facing the set, and amongst them, the GENERAL, issuing orders from a remote control both through the camera operator's headsets on how/when to move his chess pieces (the host of the show, Gina Lewis, and me). Incredible experience, and if it were not for her hubbie, mother, and kids in the studio, they might have had to cut more of my "off comment" comments... much not said, but thought in earnest. Still, a thrilling situation. The director/producer and host are vegan, and I got to make two pizzas "for the busy professional," the second being for closeups and staff internal enjoyment. Yes, that's TEN veggies on that puppy. I'll post the broadcast times later.... Here's a collage of the more tolerable photos... gawd, I was SO tired (yes, that is my "happy face") from packing/unpacking/shopping/travel. Oh well, still cool event! Somer has outdone herself w/ photos illustrating the Official Mad Cowboy Pizza from my cookbook, "Heart Healthy Pizza." Back in 2008, Howard actually worked with me in the kitchen, instructing me as to what (and in what order) he wanted on his vegan pizza. It was great sport! BTW: by going "no oil" in addition to his already vegan, he's lost considerable weight since then. Anyway, at Somer's Vedgedout Blog you'll find several photos of the creation process, all associated recipes, a short interview with yours truly, and a free giveaway of an autographed copy of Heart Healthy Pizza! Well worth your time... have fun! And my thanks to Somer for her excellent (and hard) work. "I have to admit, when I first dug into Mark’s Book, I was a little overwhelmed. There are nearly a dozen crust recipes (including some for my GF peeps!) Close to 20 sauce recipes (for the pizza base), then more than 50 No-Nonsense Non-Cheese Sauces. I mean, the combinations are nearly endless. It all felt a bit daunting! Thankfully, Mark knows how to help a home cook out, he devotes a whole chapter to some amazing pizza combinations (nearly 40 combos) to help you get started. All of the recipes in his book are vegan, heart healthy and very low in fat. Several of the combinations immediately caught my eye. 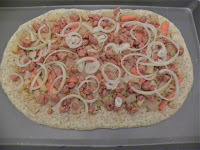 However, this Spanakopizza recipe that Mark is sharing with you today is going to be hard to beat." 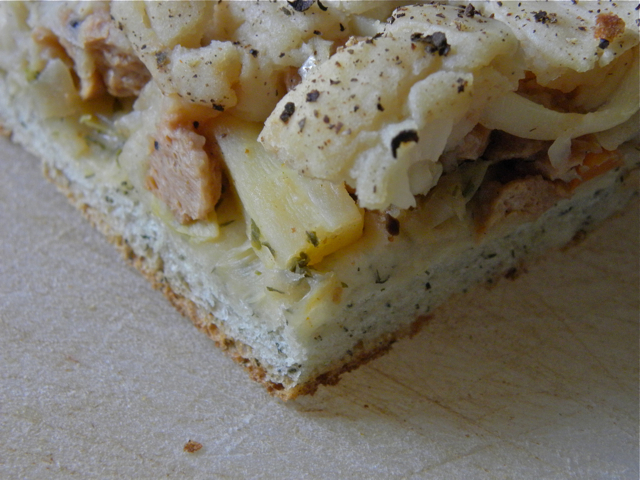 My "St. Patty's Pizza Pie" recipes from the world's first vegan pizza cookbook. All 100+ recipes are no-fat and plant-based. 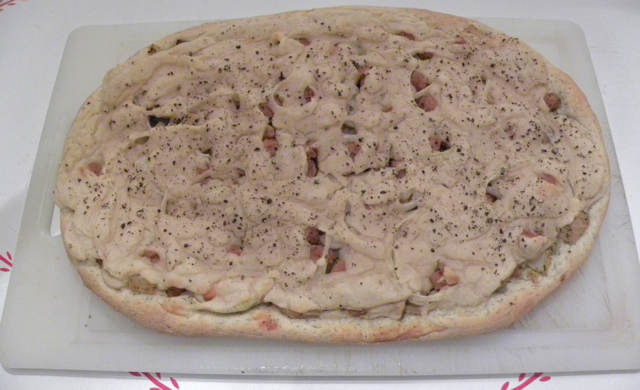 The St. Patty's Pizza Pie recipe calls for a wonderful "Barley, Navy Beans, and Horseradish" cheese-like topping sauce! 1. Pre-heat oven to 425 or 450 degrees F. (depending upon your oven). 2. Put ingredients up to soy sauce into a non-stick (preferably) saute pan or wok. Bring to a slow boil, stirring to mix, and simmer on very low until most of the liquid is gone and the vegetables are still tender crisp. Drain, let cool to room temperature. 3. 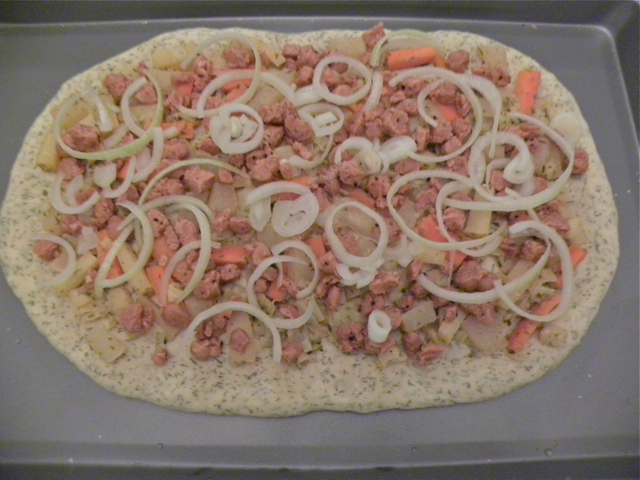 Arrange vegetable mixture on prepared and shaped dough. 4. Sprinkle on TVP Corned Beef Cubes. 5. Arrange onion slices on top of pizza. 6. Pour topping sauce on pizza. 7. Sprinkle on paprika (to taste). 8. Bake pizza for 15 to 20 minutes. • Use 3/4 cup carrots and 3/4 cup cubed potatoes instead of 1/2 cup carrots, turnips, and parsnips. Be careful not to overcook the potatoes or they will be mushy. 1. Put all ingredients into a small pot, mix, and slowly bring to a boil. 2. Simmer on very low for 10 to 15 minutes, turn off the heat, and let cool. Drain if necessary. • Substitute TVP cubes with tempeh cubes, reducing simmering time to 5 minutes. 3. Add all ingredients except the water to a blender or food processor, pulse a few times, and add half the water, pulse, and then the remaining water to blend until it's a smooth pancake-like batter. Recipes @2013 by Mark Sutton. Please include this copyright, post and my website address if you post them elsewhere. You can purchase autographed copies of "Heart Healthy Pizza" online here. Early in February, Lani Muelruth posted a short review of my book on Amazon (here). I was convalescing in a hospital at the time and didn't find out about this until a few days ago. I'm honored! Lani, aka, "The Plant-Based Fitness Expert," has been making quite a well-deserved name for herself recently, in no small part due to the success of her book, "Fit Quickies: 5 Minute Targeted Body-Shaping Workouts." Here's what she had to say about "Heart Healthy Pizza:"
"Mark Sutton's Healthy Pizza is beyond innovative. When seeking to create a pizza that is outside the usual pizza box of high fat, full of dairy or meat, one is usually left to their own devices. No more. Mark has created a book with guaranteed healthful sauces and toppings that can stake their claim in the 'whole foods, plant based healthy' world. And with endorsements by Caldwell Esselstyn, you know you can trust the contents to be heart healthy. His sauce recipes also inspire versatile application. I made one of the sauces last night to put over a salad and it was perfect! Rice, nutritional yeast, and a few other elements made a robust and tasty sauce. Next is to tackle the crust recipes, which are not wanting. Nice work Mark!" Clever cook! Only in recent months, when I've had chance to test the idea of using some of the 60 "cheese-like" topping sauces on pasta, in casseroles, on veggies, on potatoes, in quesadillas, etc., did I affirm that, generically, pretty much all of them can be used this way and NOT just on top of pizza (or underneath the vegetable fillings, depending upon whether you are a "top" or "bottom" person). I mention the possibility briefly in my book, but the process is simply to use leftover sauce (maybe thinned a bit) to, say, integrate with stir-fried vegetables until it gets creamy. Or, pre-heat the sauce in a sauce pan until it thickens, and then use in any number of ways. However, Lani figured it out and I appreciate not only her succinct and great review, but noting how "versatile" the recipes are. Thanks Lani! ...and, you can order an autographed copy of "Heart Health Pizza" here! "Thai" Issue of Vegan Culinary Experience is Available! The Vegetarian Resource Group Reviews "Heart Healthy Pizza!" One of the 1st vegan cookbooks I ever purchased was "Simply Vegan," by Debra Wasserman. Debra's co-director of one of the oldest vegetarian/vegan informational organizations in the country (The Vegetarian Resource Group), as well as co-founder of the long-running, "Vegetarian Resource Journal." This issue of the VRG isn't available currently online, so above is an image link to the full review (next to one of Nava's great "Wild About Greens!" cookbook). Remember, you can order an autographed copy of "Heart Healthy PIzza" here. Both images from the VRG Journal in this post are @2013 by VRG. Photos: 1st Ever Heart-Healthy Pizza Public Demonstration/Sampling!!! Well did it!!! 9 16" no-oil heart healthy plant-based pizzas served to 30 hungry guests in 3 hours (I had decided to serve one to volunteeers before we got started; they often don't get to eat, and can see how I approached making a pizza). The day was incredible, and we learned a helluva lot pulling this "first time ever" demonstration. The Vegetarian Society of DC (Saurabh (the Pres., managing, food prepping, serving, speaking), Paige (food prepper extraordinaire, serving, speaking). Diane (food prepping, serving, managing, photography), Colette (photography), and Rodney (all-around problem solver, member of the Eastern Village Co-Housing Community where this presentation was accomplished) were absolutely amazing. Fortunately, all I had to do was bring 8 16" pizza crusts premade, topping ingredients pre-measured segregated, and sit and watch the fun... yeah, right... It was exhausting. Aggravated my leg injury, hadda use a cane for the first time in five weeks. Oh well, adversity makes it all the sweeter when the team is victorious. In any case, my deepest appreciation to the VSDC and volunteers for all their hard work. It was truly an exciting and thrilling time. Clearly, though, the most popular pizza was the "Really Reubenesque" (you can see it in the photos before being smothered in oat/cannelinni beans/horseradish 'cheese-like sauce"), which is straight from my book. Here's a link to some 170 photos of the party, with copyrights going to Diane Payne, Colette Price, and Mark Sutton. I've also added two of my favorite photos below. Enjoy! The event was on January 13th, 2013. Diane, Mark, Rodney, Paige, and Saurabh: We Make Heart Healthy Pizza!! "...Freaky Awesome Sauces & Pizza Amoebas..."
Love this FB post from Lori. Helps keep me working hard to get the word out about what my 5+ years of research into writing the 1st Vegan Pizza Cookbook (self-published) has accomplished in helping people to make the penultimate comfort food in a heart healthy way. Here's the part of the quote/comment (among others), the link to it on Facebook (so damn cool to see a my book in the photo!) that's the source of photo and comments. "...they turned out awesome, im not afraid to try the more complex ones now. This was the confidence I needed for some of those freaky awesome sauces I saw in the book (Heart Healthy Pizza)." I haven't had much time the past several months, due to recovering from an injury and self-marketing my book. Great fun to get to spent a little discretionary time doing one of the things that made my career (particularly at NASA): video animation. Although I'm very new to the software I used, and it's got me puzzled, can't do all I want to (yet), here's my first test showing the results of another test, a humongous vegan pizza in prep for my presentation/demonstration later this month in the DC area. Enjoy! (there's also a "mobile" version at my YouTube Channel as well). "Friday night "Dinner & a Movie" & a home-brewed beer. Last night we streamed, "Bernie" http://tinyurl.com/c8whr6t Jack Black & Shirley MacLaine in a hilarious black comedy based on a true small Texan town's murder. Thoroughly enjoyed it, along with homemade pizza schmeared with "Heart Healthy Pizza's" millet, cashew, mustard sauce, & our fave toppings. I'm hooked on it. Great cheese substitute." So so cool... she interviewed me last month, and it'll be neat to see it published soon. A long time champion of a no-added oil plant-based diet, she's one of the most knowledgeable people regarding diet and nutrition I've ever interacted with. A real blessing. You can learn more about the 1st Vegan Pizza Cookbook, "Heart Healthy Pizza," here. Around 60 different "cheese-like" sauces amongst the 112 recipes. Namaste! "We were 100% happy & used to cheese-free pizza. But, after Mark Sutton asked me to try one of the toppings in his "Heart Healthy Pizza", I decided to give it a try. Oh baby, it really added a delicious creamy dimension to the pizza. No cheese WAS fine--but, this is BETTER! Worth a try & very cheap & easy to make. I'm going to try it on tacos or a taco salad."